Discovering fungal activity in your Collingswood NJ home or business can be very alarming and stressful. Mold can rapidly colonize its environment, and it will easily spread and threaten your South Jersey property value and your family’s health. The MasterTech Team understands the sense of urgency and the risks involved with mold. This is why, our industry specialists will always recommend immediate, safe and effective action to addressing the mold concerns. When it comes to mold, getting it wrong the first time can have serious and costly repercussions on your home and family. That is why at MasterTech Environmental, we are committed to getting the job done right the first time. As proof of our commitment to you and your family’s health and safety, MasterTech includes a 5 year mold-free warranty with every Camden County, NJ Mold Removal. If you are concerned you might have mold in your Collingswood, NJ property, you should contact a trustworthy mold expert to conduct a full mold inspection the Collingswood, NJ home. An accurate inspection, completed by a trained mold inspector with the necessary training and equipment, will confirm or deny the existence of mold, determine the causation of the mold, and identify the full extent of the mold development. After the completion of a comprehensive mold inspection, your MasterTech inspector will be able to draft an appropriate course of action to resolve your mold problems. Visual Evaluation– An inspector will complete a visual analysis of your Collingswood property to identify any conditions that could perpetuate mold growth in your home or business. All findings will be digitally documented and available for your records. Report of Findings– Your inspector will compile all his or her findings into a clear and concise report for you to review and keep. If necessary and requested for, your inspector will present you with a detailed scope of work for a complete Collingswood, NJ mold removal. The MasterTech Team in South Jersey has taken every possible measure to ensure you and your family will be returning to a mold-free and safe home. This includes avoiding the use of the harsh and dangerous chemicals during your mold removal process. We use the safest and most effective methods to complete each mold removal in Collingswood, NJ. Our team of experts is constantly testing and researching newly developed mold removal methods, to ensure that our process is the safest, most effective, and most up-to-date as possible. 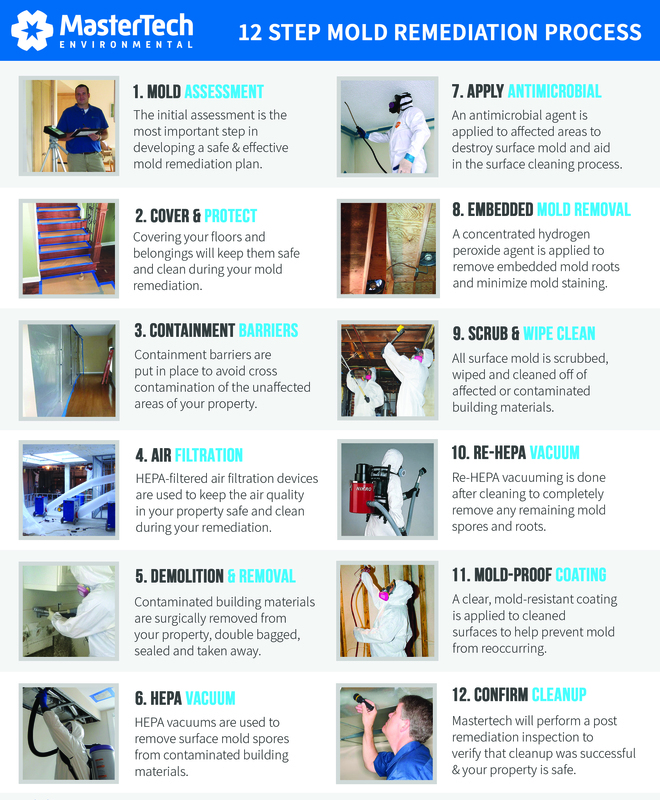 MasterTech’s team of mold remediation industry experts have laboriously crafted a step-by-step mold removal process that is safe, effective, and efficient for your South Jersey home or business. Each mold remediation in Collingswood, NJ incorporates the safest and most up-to-date methods and techniques, so we can be confident that the mold remediation job is done right the first time. Additionally, every mold remediation completed by Mastertech Environmental in Collingswood NJ is backed by a 5 year mold free warranty. Our mold remediation clients also receive a certificate of mold remediation with each mold removal project. MasterTech Environmental is a family owned and operated, local company that specializes in environmentally services. We are one of New Jersey’s top rated Mold Removal Company for homes and businesses. Are you looking for a mold inspection or mold removal in Camden County, NJ? For mold removal Tavistock, NJ or mold inspection Bellmawr, NJ, call to speak with one of our MasterTech Mold Specialists today!